Mt. Kailash, 6,740 m. is situated to the north of the Himalayan barrier, wholly within Tibet. Mt. Kailash is the perfect mountain with awesome beauty, with 4 great faces. It is the spiritual center for four great religions: Tibetan Buddhism, Hinduism, the Jain religion and the pre Buddhist animistic religion - Bonpo. To Tibetans it is known as Khang Rimpoche (Precious Jewel of Snow) and they see it as the navel of the world. It is said that a stream from holy Mt. Kailash pours into a nearby lake and from here rivers flow in the four cardinal directions. The River of the Lion Mouth to the North, the River of the Horse Mouth to the east, the River of the Peacock Mouth to the south and the River of the Elephant Mouth to the West. Strangely enough, four major rivers do indeed originate near Kailash, the Indus, the Yarlung Tsangpo (Brahmaputra), the Karnali and the Sutlej. Tibetans believe that it is the residence of Demchog, a fierce looking tantric deity who lives there with his consort, Dorje Phagmo. For the Tibetans also, it is a particularly special place in that their poet saint Milarepa, spent several years here meditating in a cave . 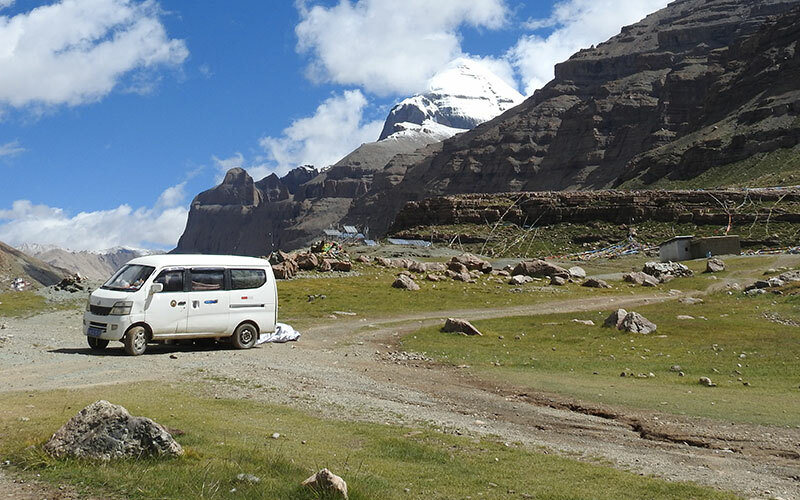 The two weeks long Kailash Mansarovar tour by overland from Kathmandu via Kyirong is a very suitable touring option for those who wish do not want to rush the trip and also want to explore the beautiful countryside and nature of Tibet. Arrive at the Tribhuvan International Airport, our tour representative will be there to greet you. Once done, transfer to your pre-booked accommodation in Kathmandu, check into your hotel and after that you can indulge in the exploration of this city and also walk in the local markets. Stay overnight in Kathmandu at 3* equivalent hotel on twin/triple sharing basis. Optional : You can also opt for the mountain flight today and it is going to take you over the world’s highest mountains giving you amazing scenic views. In case, you are interested we shall get it booked for you and since these operate at around 6:30 am, you would have to wake up early morning and get ready by 5:30 am. Have some breakfast and then start your drive towards Dhunche or Shyabru Besi. It has to be noted that the road conditions as well as the drive might not be favourable at some spots during this drive, thus this journey shall prove to be a little tiring and hectic for you. On your arrival at Dhunche/Shyabru Besi, check into your booked accommodation there. You are free to spend your remaining time in leisure. Overnight stay at your accommodation that would be a basic dormitory styled guesthouse. Today, wake up as per your comfort zone since you are free to spend your time the way you want this day. Have some breakfast and then you can participate in a small trek while walking amidst the market places and other local areas in Kerung. Then, attend a short briefing. Stay overnight in Kerung at a dormitory styled guesthouse. Once you are done with the breakfast, indulge in a mesmerizing drive towards New Dongba while having a fascinating view of the very beautiful Brahmaputra River. You can give a midway halt at Saga town for having some lunch and afterwards continue your drive in order to reach New Dongba. On reaching New Dongba, check into your pre-booked dormitory styled for overnight stay. Today is going to be really important since you are going to have the first Darshan of pious Lake Manasarovar. Start your day with some tasty breakfast and then start your drive in order to reach the holy Manasarovar. While being on your way, give a midway halt at the Mayumla Pass (4800m) to complete all your custom formalities there. During the procession of these formalities, you can have some packed lunch facilitated by the members of our team. Once done, continue with your drive while passing amidst Mayumla pass as well as the Paryang County. You can have the first sight of the spiritual Mount Kailash from Lake Manasarovar’s shore. Before arriving at the Lake Manasarovar, you will have to complete some immigration formalities and once done, start your drive to reach your pre-booked Chui Gompa’s guesthouse (whether we would have to change the vehicles and travel in the local buses or not, this decision will depend on the permission from local authorities there). You will be completing more than half i.e. 75% of Lake Manasarovar’s circumambulation today. 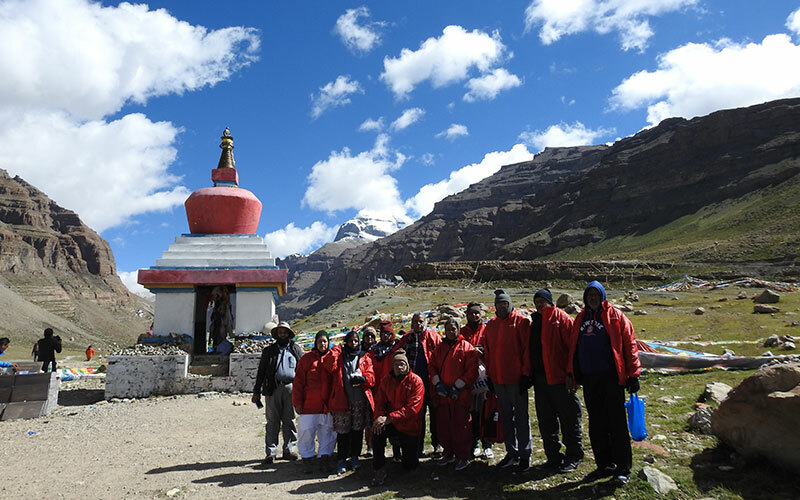 Rest of the trek shall be completed by you once you have returned from Mount Kailash’s circumambulation. At evening, you can either spend some time while having the view of holy Lake Manasarovar or you can also explore the splendid Chiu Gompa Monastery. Once done, return back to your accommodation and then stay overnight there. Wake up as per your comfort and then we are going to search for a perfect place where you can have the holy dips of Lake Manasarovar and also do some Pooja on the banks of this lake. Once done with your spiritual activities at Manasarovar, it’s the time for you to indulge in a small drive towards Darchen (special shower tents can be arranged for ladies where they can change their clothes after the holy dips in Lake Manasarovar at a feasible place). Have a view of Lake Rakshastal during your drive to Darchen. On reaching there, check into your pre-booked hotel/guesthouse/lodge and then stay overnight there. Optional trip: An Ashtapad excursion trip can be arranged by our team on special request basis, but before that you must keep it in mind that if there is no permission from the Chinese authorities, then you shall be given no transport services. The Ashtapad trip is dependent totally on local authorities’ permission and also you would have to hire the Tibetan Guides on a direct payment basis. Commence your day with some tasty breakfast and then you will be driven to Yam Dwar. On reaching Yam Dwar, start your trek towards Dirapuk. You can do this trek either on pony or on foot. On reaching Dirapuk, you can take some pictures of Mount Kailash. On completing your trek, you can stay overnight in your lodge/guesthouse at Dirapuk after having some quick dinner. Wake up early today morning and then start your trek towards Zuthulphuk from Dirapuk. On the way you are going to spot Gauri Kund while descending from Dolma La Pass (trek’s highest point). Arrive at Zuthulphuk in the evening and then stay overnight at a dormitory styled guesthouse. This day marks the end of your parikrama as today is the last day of your trek. Wake up as per your comfort, have some decent breakfast and then indulge in trek having a tenure of approx. 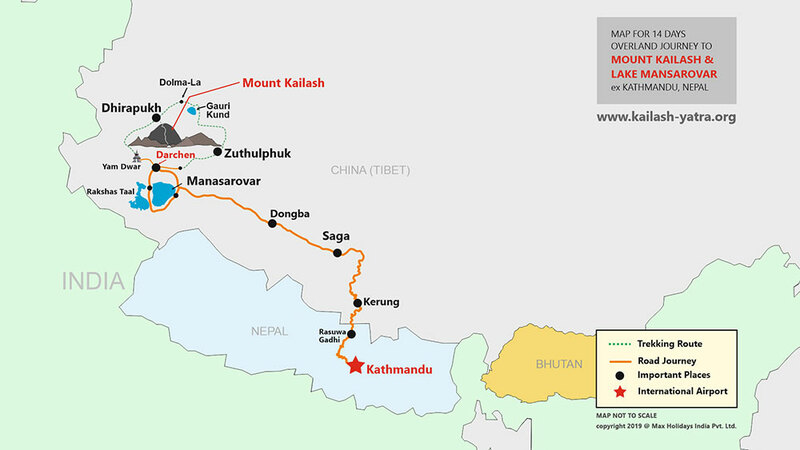 4-5 hours in order to reach Darchen. During your trek towards Darchen, you shall be picked up by our vehicle from the midway and it is going to drop you at Darchen. On your arrival at Darchen, have some lunch and later drive towards New Dongba accompanied with the completion of remaining 30% of Lake Manasarovar’s Parikrama. Overnight stay at a dormitory styled guesthouse. Commence your day with some breakfast and then start your drive towards Keyrong from Dongba. Arrive at Keyrong and then, have some rest by spending an overnight in Keyrong’s dormitory styled guesthouse/lodge. Arrive at Kathmandu through a scenic drive once you are done with your breakfast at Keyrong’s guesthouse. Firstly, reach Rasuwagadhi and complete the custom formalities there. Ultimately reach Kathmandu and then, stay overnight at your pre-booked hotel after having some dinner. Once done with the breakfast, you will be facilitated with an assisted transfer to the Tribhuvan International Airport for flying back home/onward destination. Important remark for accommodation : It is to be noted that the single/twin sharing rooms will be provided only in Kathmandu. At all other places only small guest houses or hotels are available where rooms will be on sharing basis with other pilgrims (dormitories) on twin/triple or multi sharing basis depending on the availability. Kathmandu sightseeing, Kailash & Manasarovar darshan. In Kailash Mansarovar trekking tour you will be staying in basic 3-4 star accommodation in Kathmandu and in ordinary guest houses or tents in Tibet region. The accommodation in this region is very basic and food will be pure vegetarian cooked by the Nepalese chef and his team travelling with the group to Kailash Mansarovar. Remark : You can ask us to upgrade your accommodation in Kathmandu at additional cost. 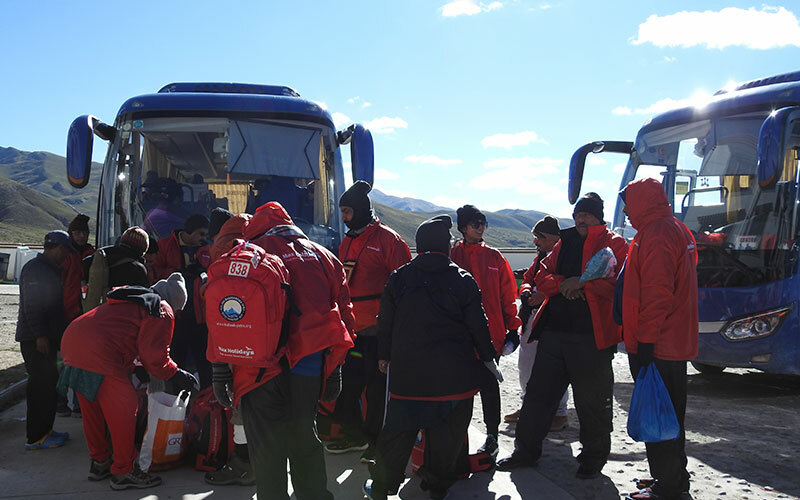 "Thank you Team Maxholidays for such a beautiful trip to Kaislash Mansarovar. June 2017 is the Time when me and my 11 Co Passengers found a New Family in you all. Right from the Guide to managing Team in Nepal Gunj/ Simikot/Hilsa/China/Lake Mansarovar... to the Boss... all kept the Care and Warmth always..
Next year Mt Everest Base Camp .. Thank you once again for being so helpful and caring and Personally watching on Us.. Felt Safe.."
"My recent travel to Kailash Mansarovar with family and friends was organised by Max Holidays. Everything was well taken care and superbly coordinated by the team of this tour company. I can say that it is surely not easy for them to organise this trip in remote lands of Nepal and Tibet where technical problems and weather issues are quite common to disturb your travel plans. Travelers who do not understand the technicalities of this trip and blame the company for delays or unwanted problems, they must not chose to go on this pilgrimage. I saw and met with many pilgrims blaming the agency for nothing, just to ensure to get many things for FREE from the tour Company. This is certainly a weird mentality of those travelers as the company and its staff is always putting their best efforts for our safety and completeness of the trip. MAX HOLIDAYS ROCKS! Good luck Vishal Gogia and team Max Holidays."